Floral patterns may bring back some not-so-pleasant memories of your grandmother’s curtains, but they’re making a comeback. Gone are the days when floral prints are on the list of outdated trends to avoid. They can add a fresh, modern pop of colour to your home — just in time for spring. Think big, bold prints, bright colours and contemporary designs to keep your floral-themed decor fresh for spring 2015. Floral prints are the perfect way to bring several colours into your space without it feeling overwhelming. The whimsical nature of the floral print will make the multitude of colours seem cohesive. Anything goes for modern florals. 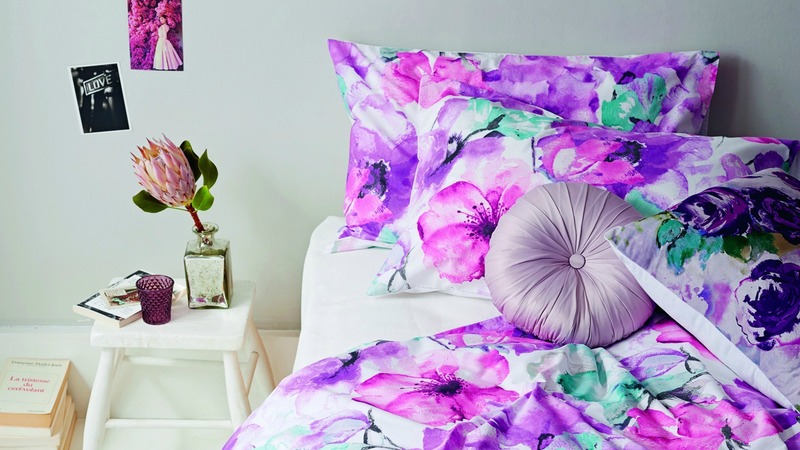 Mix floral prints with bedding and soft furnishings in abstract prints if you prefer the contemporary look. Remember to keep the rest of your decor, like paint colours or furnishings, understated if your floral pattern is extremely bold or detailed. Rough textures can help add a little masculinity to balance the floral print, while metallics can be used to add a touch of sophistication. If you want to play it safe keep a neutral base and introduce floral accessories. Scatter cushions and wall art are perfect for injecting a touch of spring into your home and they can be easily replaced from season to season. Florals look great on china but don’t go for a matching set: collect tea cups and saucers in different patterns for a more eclectic, modern effect. The trick with floral prints is always to establish a balance in the room. To avoid making your space look outdated, opt for sleek and modern furnishings and other accessories that will provide a nice contrast to the more traditional floral prints. Instead of pastels or brights, why not go for something darker? Floral prints can work in every room of your house if you choose wisely. A really modern way to update the floral print trend is to go for a pixelated effect. It’s a contemporary twist on the traditional floral and, if you stick to something in a fairly subtle shade palette, you can introduce pops of colour with accessories and textiles.